For a living, culinary artist Chef Ray L. Duey gets to do exactly what his parents told him not to do—play with his food. Perfecting his craft for the last 42 years, the 62-year-old chef has become world-renowned for his beautiful—and often, fantastical—creations. 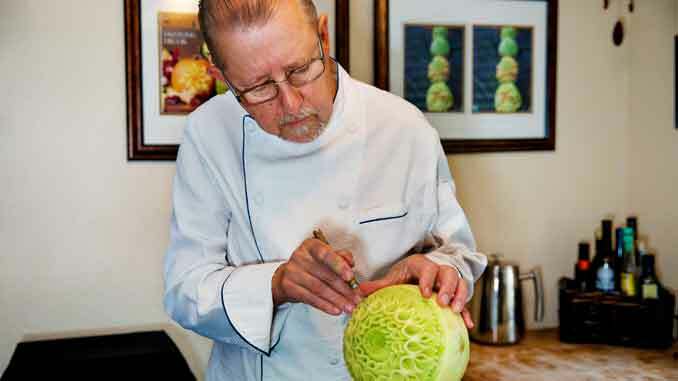 From intricately carved melon centerpieces that tower to the ceiling, to the tiniest of tiny sculptures (for example, a butterfly carved from a quarter of a grape), Chef Duey’s work has been recognized and coveted by everyone from The Food Network to the Obama White House. And working fast was a key skill to be employed on The Food Network. Both a contender on the Network’s Sugar Dome as well as The Rematch: Fantasy Fruit Sculpture, for the latter production, Chef Duey had just eight hours to complete his piece, and a migraine to make things interesting. Despite it all, his team still won the competition. You may have also seen Chef Duey’s work in the first season FX’s hit show, “American Horror Story”. Those incredibly detailed lanterns? You’re looking at the work of Chef Duey. His spookier sculpting talents even landed him a trip to the Obama White House for their annual Halloween celebration—the chef and several other culinary artists carved a 3-by-4-foot haunted house out of pumpkins for the President’s event. When he’s not traveling the country, teaching classes, or attending events, you can find Chef Duey posted at various farmer’s markets and fairs. There, he delights and amazes patrons with his artistic feats, namely, the creation of his favorite piece: the potato rose, which he carves to Bette Midler’s song “The Rose”. In fact, one of his most emotional memories comes from a potato rose demonstration at a state fair in Tulsa. In the end, Chef Duey realizes that it’s not about the sculptures he makes, but the relationships he forms through his work. Today, Chef Duey focuses his efforts on sharing his talents with others, so that they too, may create works of culinary art that inspire and move people. Chef Ray is a consummate professional in all be does. But his enormous talents are a small part of his amazing career. It’s his humanity, his compassion for others that sets him apart. Whether it’s a struggling student or a grizzled line cook fumbling wth a tiny radish and a paring knife, Chef Ray provides reassurance with the tenderness of a doting new parent.